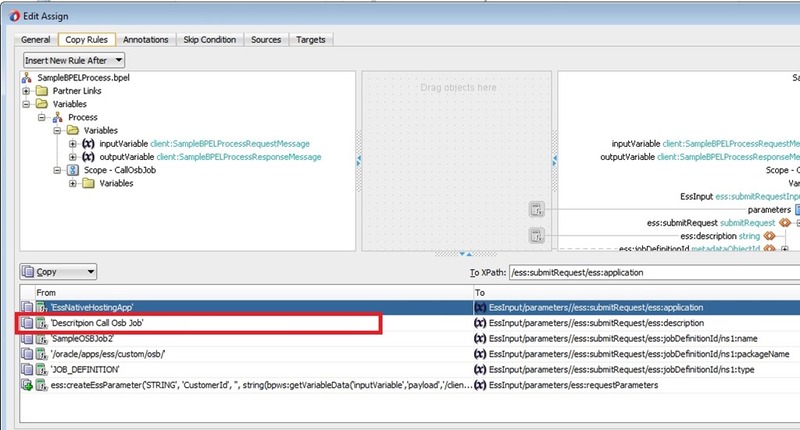 We used only GET method for demonstration and typically this would not be the case as REST service can also support other HTTP methods (POST, PUT and DELETE). 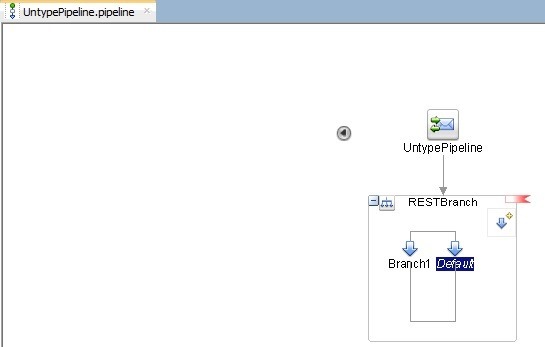 No branching in Typed REST Services when multiple HTTP methods are supported. 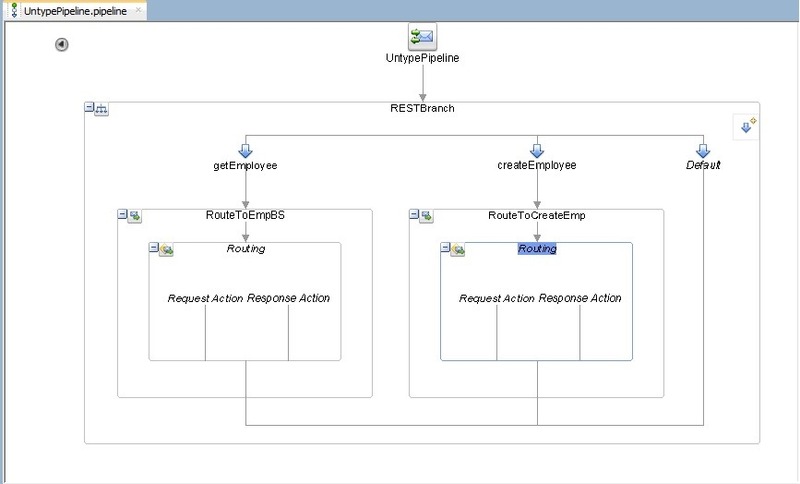 No branching in Un-Typed REST Services when multiple HTTP methods are supported. In this post, we will try to cover above aspects. Note that all of this discussion is related to native REST services unless stated otherwise. 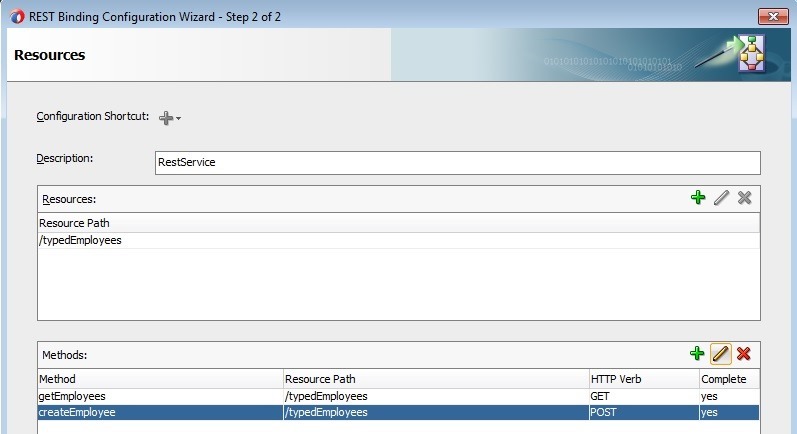 Add POST method support for typedEmployees resource as shown below. 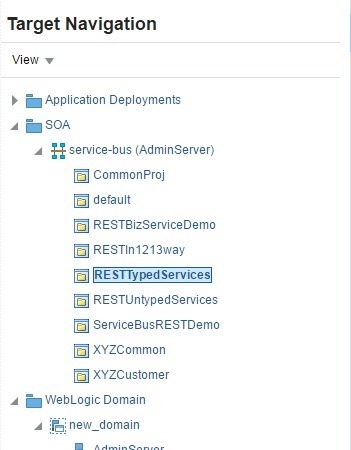 Since Typed REST Service uses WADL and contains Operation name annotated with soa:name, we can simply make use of Operational Branch. You can use URL like below to access REST Service. 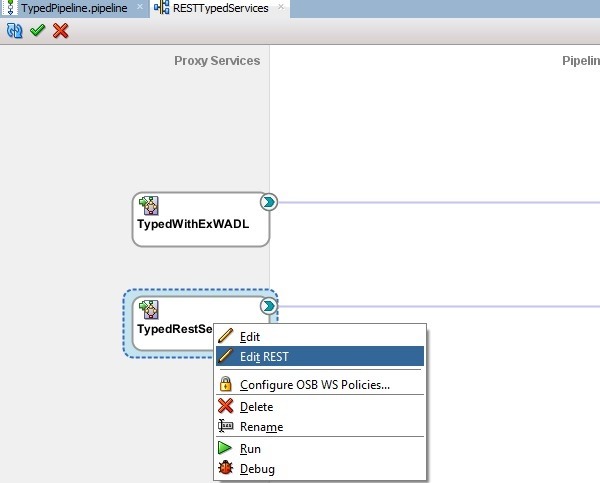 Since Un-Typed REST services does not use WADL, we can’t use Operational Branch as above. So in this release, OSB introduced a new node called REST Branch for this purpose. Add REST Branch in pipeline by dragging it from Components. 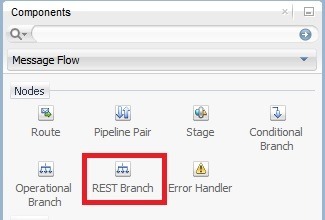 For each REST branch, give supported Media Types, Resource Path and HTTP method mandatorily. Use + icon to add media types and give other information as shown below. This means we are creating a REST resource called untypedEmployees which supports GET and supported media types are application/xml, application/ json. 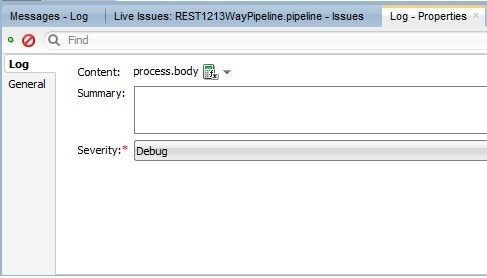 Modify REST branch name in General section of Properties. We can add more branches using highlighted icon below. 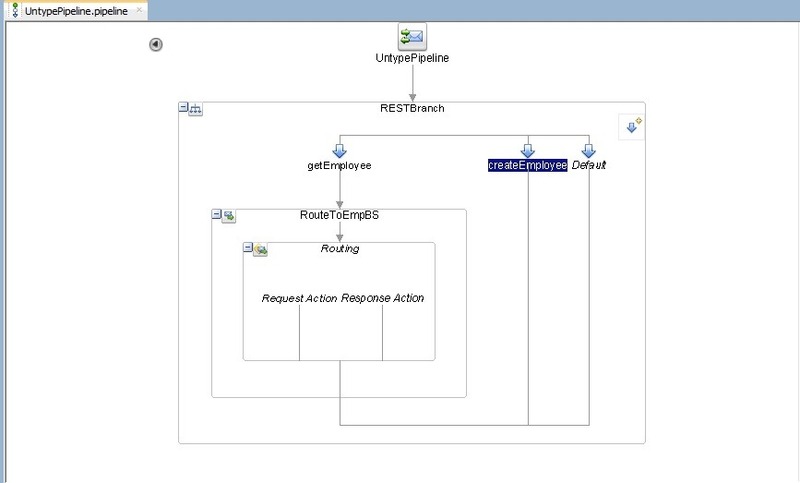 We can add POST method support for same resource path as shown below. Test Proxy as shown below. Note that we had specified required parameters in HTTP headers. You can use URL like below to access this REST Service and make sure that Content-Type is passed without fail. 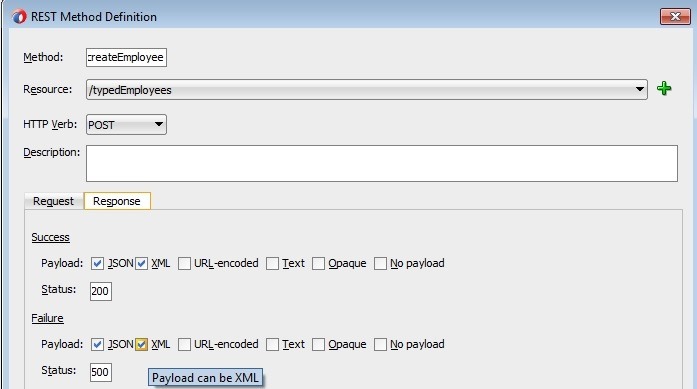 OSB parses payload based on HTTP header Content-Type in request. We can Use Log activity to see $body contents. Refer to this post to enable logging. 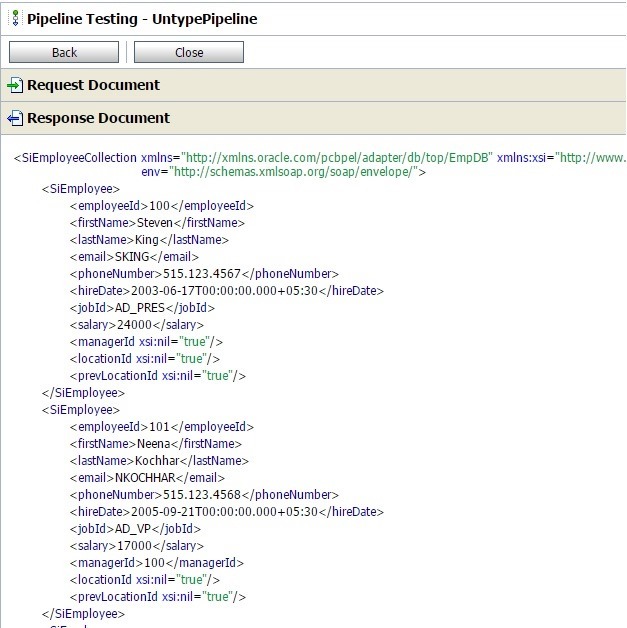 When Content-Type is application/xml, $body is logged as below. 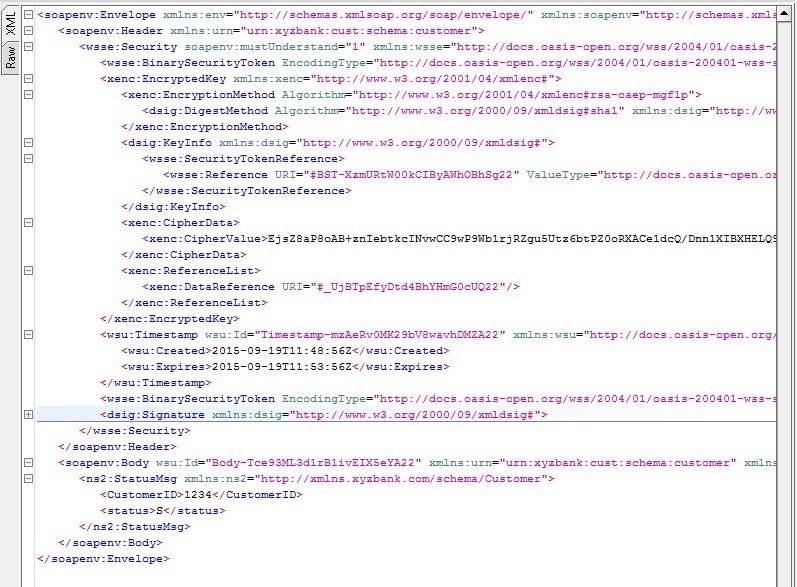 When Content-Type is application/json, $body is logged as below. 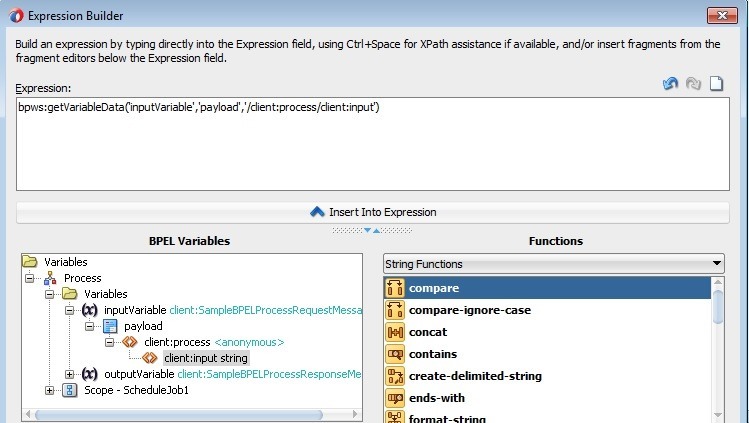 OSB binds a globally-scoped object called process and can be used as process.body or process.var which is similar to $body and $xyz XPath variables. This notation is used for Java Script expressions. 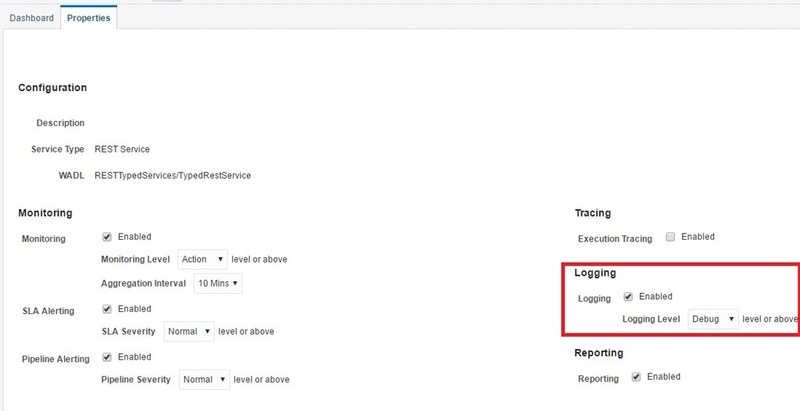 Use Log activity as below in Java Script expressions to verify the same. 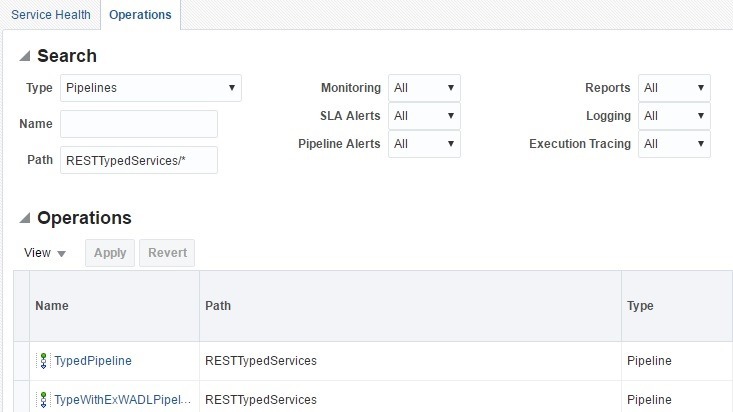 Though REST service supports JSON/XML payload, there is no automatic conversion takes place at runtime and to be done programmatically in native REST services. 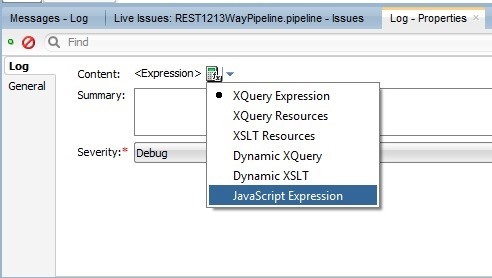 When using End-to-End XML, use XQuery/XSLT for transformation. 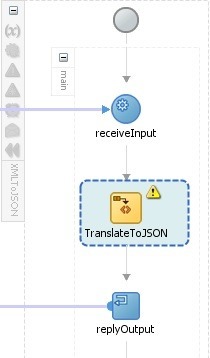 When using End-to-End JSON, use Java script for transformation. 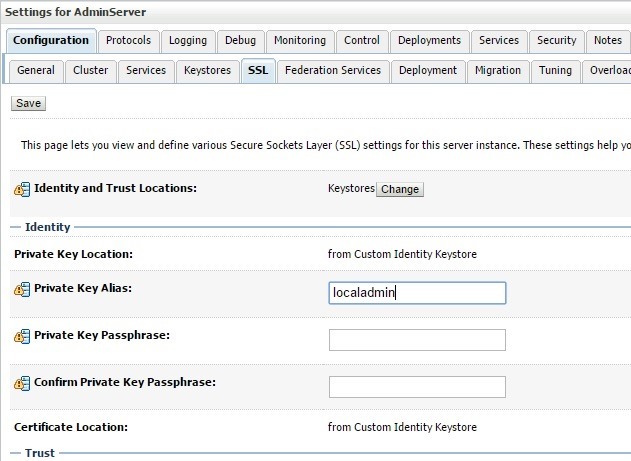 In this post, we will use KSS (Keystore Service) for SSL setup. The screenshots showed in this post are based on SOA 12.2.1 but these steps remain same for 12.1.3 as well. Oracle recommends key size to be more than equal to 1024. If we want to get it signed by any CA, we can generate CSR by clicking Generate CSR which is recommended for Production env. But for Development purpose we can use this keystore as it is. 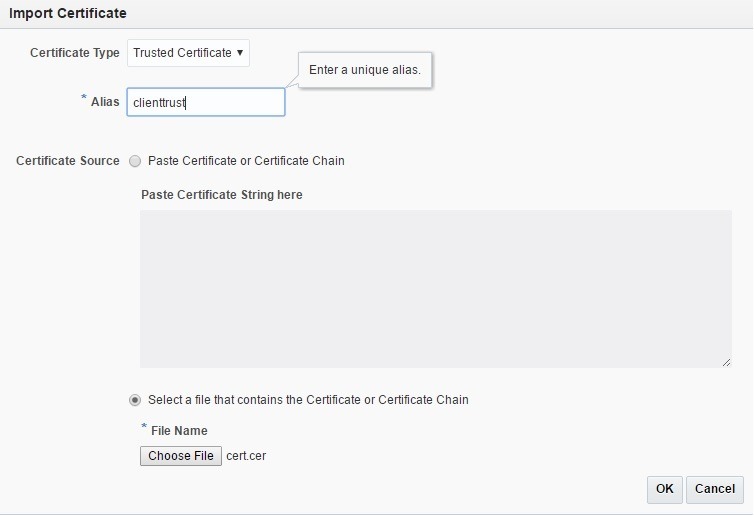 Clicking on alias name will bring up the following screen showing the certificate information. 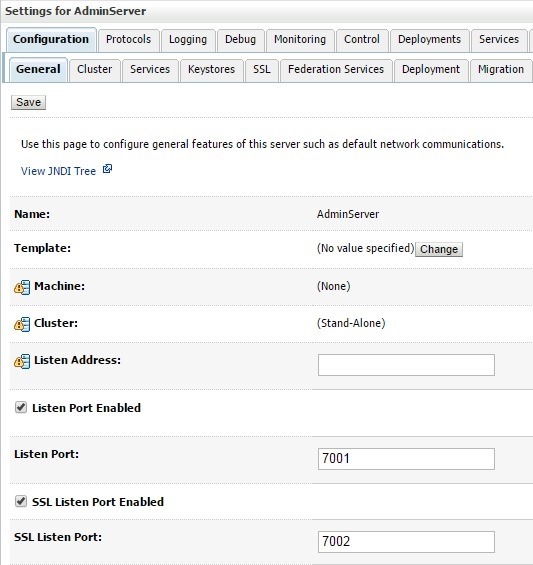 Enable SSL port by navigating to Environment –> Severs-> Admin Sever –> General. Go to Keystores tab. 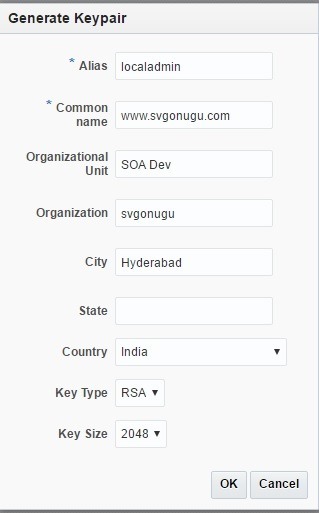 Click Change to select Custom Identity and Custom Trust as shown below and click Save to save the changes. Modify Custom Identity and Trust stores as shown below. observe the usage of system trust store kss://system/trust. 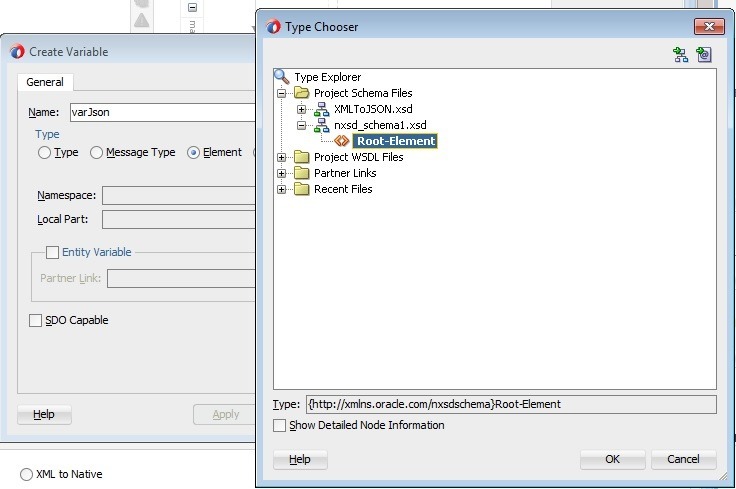 Oracle recommends this approach to simplify the trusted certificates setup. Go to SSL tab and give the Private key alias as shown below. Here give the password as “password” and click Save. See related note at end of this post. 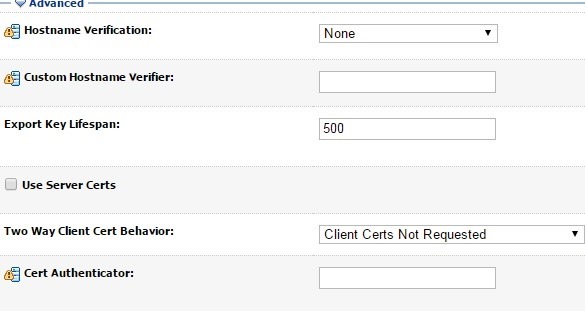 Go to Advanced settings and set Hostname verification to None and also set Two way Client Cert Behavior to Clients Certs not Required as we are doing setup for 1-way SSL. This setting will enforce WLS server not to request client certificates. Restart the server and now we should be able to access admin console using HTTPS URL like http://localhost:7002/console. Similarly, configure OSB managed server using same Keystore or by creating a new one similar to above as shown in the following screenshots.. Restart the server after changes. 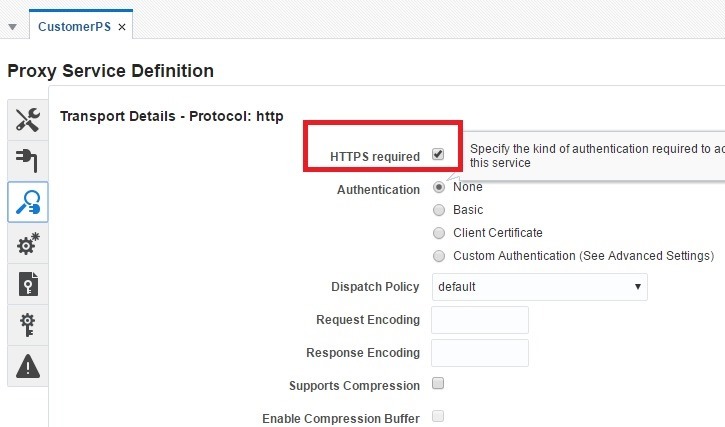 Enable HTTPS for OSB proxy service as shown below. Refer to this post for 2-way SSL setup and follow below steps to import the certificate into trust store. 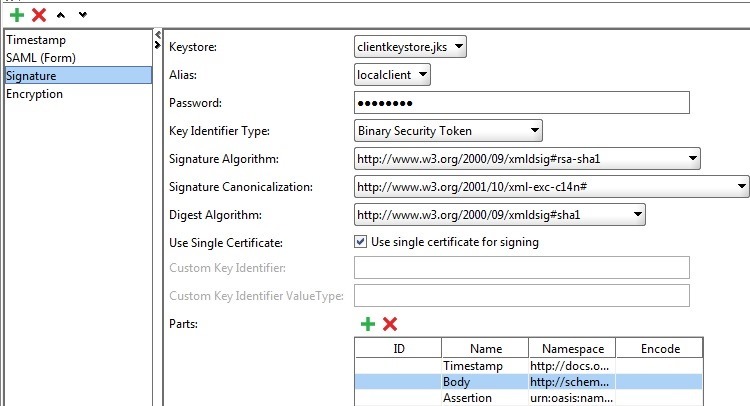 Note that KSS does not support certificate in binary format which is the default encoding used by JKS. We can use –rfc option of keytool command to export the certificate into printable encoding format as shown below. When no Private Key Passphrase is mentioned in the SSL tab, em console is not accessible and following errors are shown in the log. 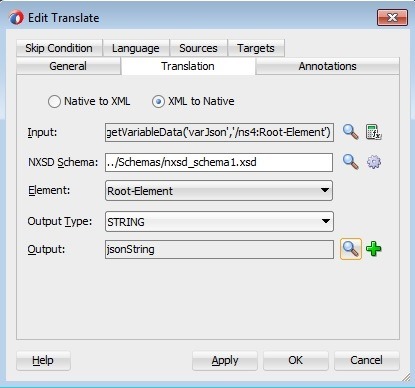 In this post, we will discuss about using Translate activity for converting XML to JSON. This is one of the functionalities I wanted to try since release of 12c as nxsd has been enhanced to handle JSON as well. So I tried this using BPEL in both 12.1.3 and 12.2.1 but found to be not working as expected. Hence I will just mention about approach to use Translate activity. And will show you how its working with File Adapter. 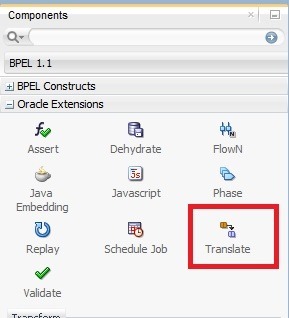 Create a BPEL process and drag Translate activity. 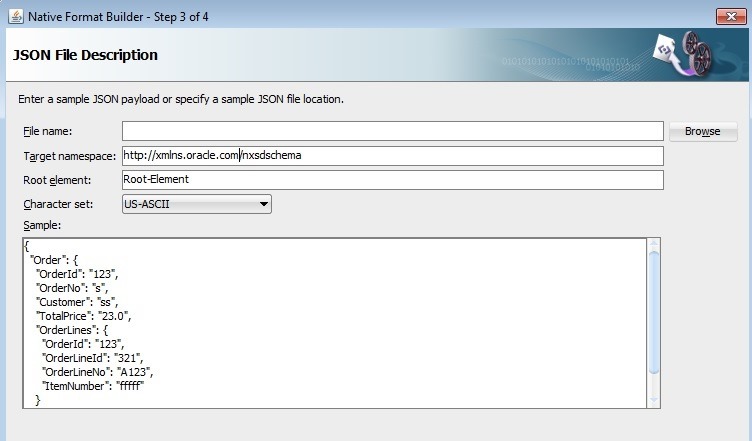 Click gear icon to define NXSD schema as per required JSON data. 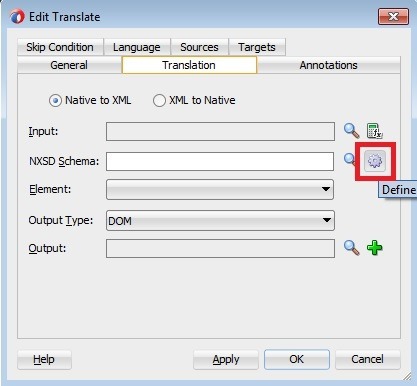 Finish the wizard as shown below to create NXSD. 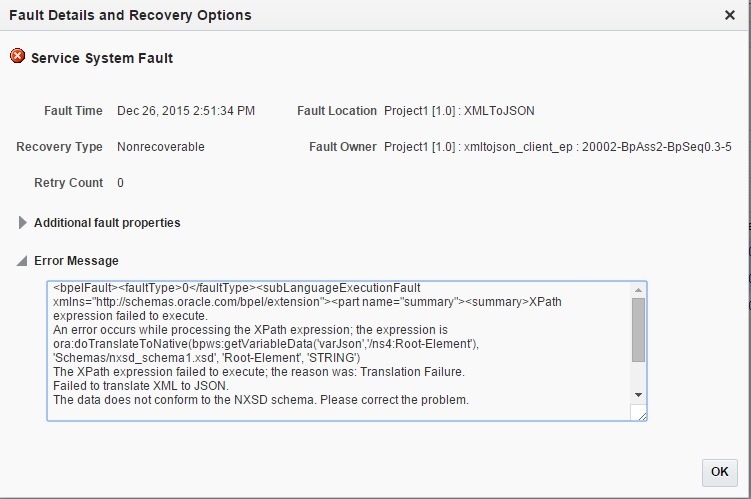 Create BPEL variable varJson of NXSD complex type as shown below. 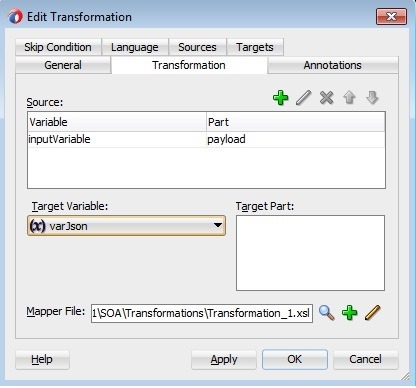 Create XSLT transformation to transform the input variable to varJson. For simplicity, we considered the NXSD structure almost similar to inputVariable. Now modify Translate activity by giving required values for all other fields. Click OK. Now our BPEL process should look like below. Deploy the composite and test to observe the following error. Note: Please note that the issue has been fixed in latest releases of SOA suite as observed by readers. 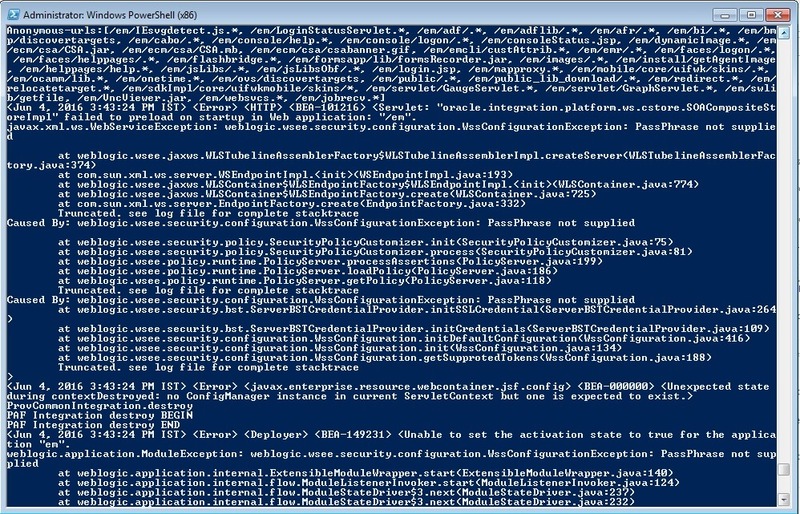 However, the same XML to JSON translation is working as expected with File Adapter. 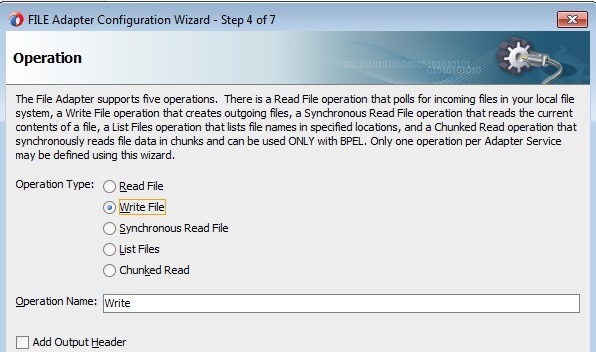 Create file adapter using below screenshots using Write operation. 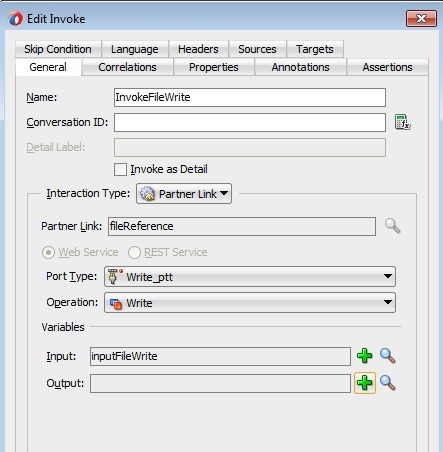 Now in BPEL process, create invoke activity to invoke the file adapter. 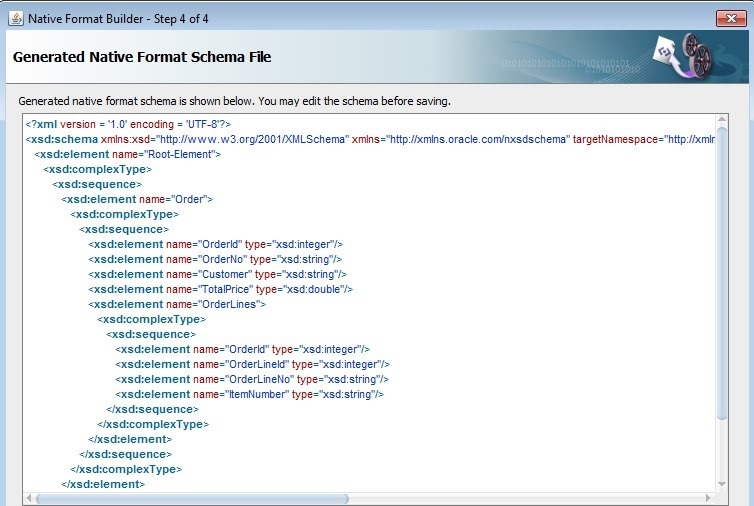 Now create XSLT to transform inputVariable to inputFileWrite. Now deploy composite again and test using same input as above. Now we will observe an output file in directory D as shown below. You can find a sample project here having both of the cases discussed above. 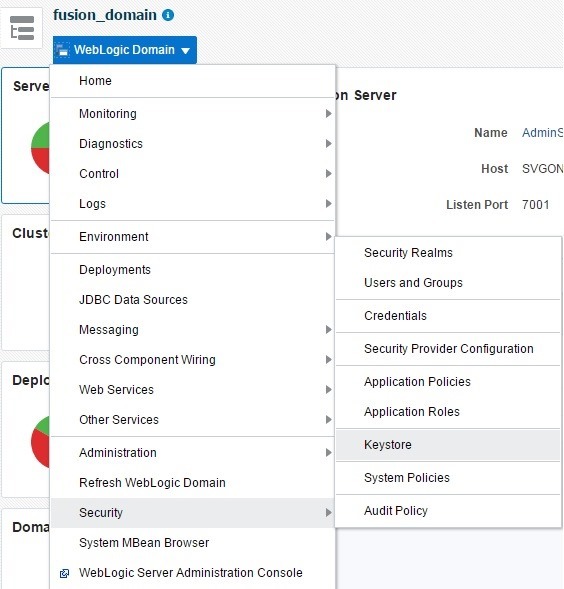 In this post, we will see the required setup for WSS10 SAML policies and we will use SOAP UI to demonstrate client side setup in brief and recommend to refer to previous post for detailed steps to create Outgoing Configuration at client side and server side keystore setup. 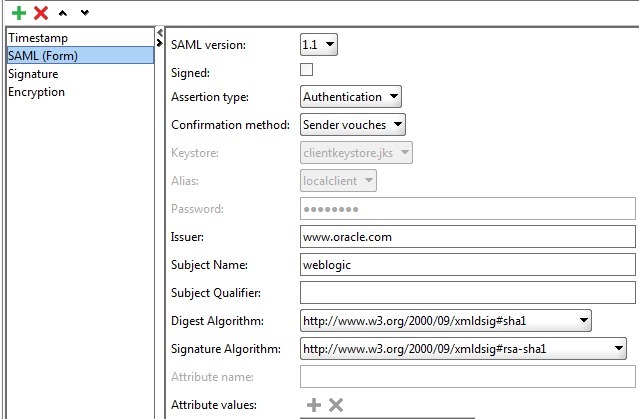 Create an Outgoing Configuration with SAML Token as shown below. 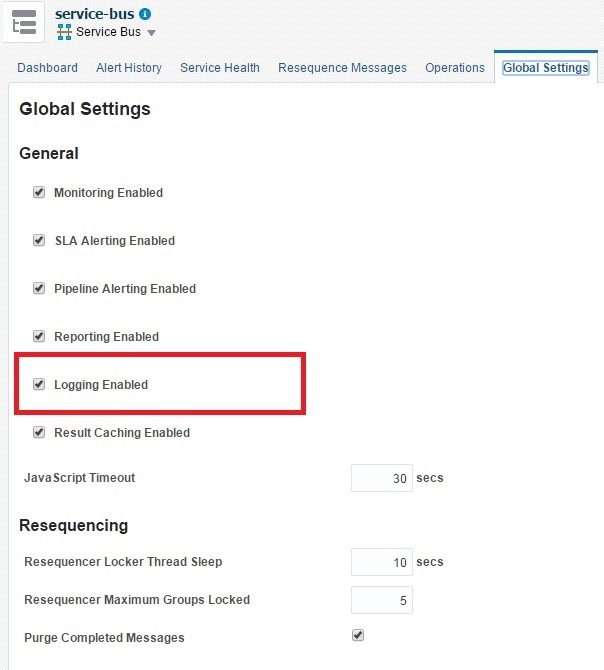 Attach Outgoing Configuration to request as shown below. 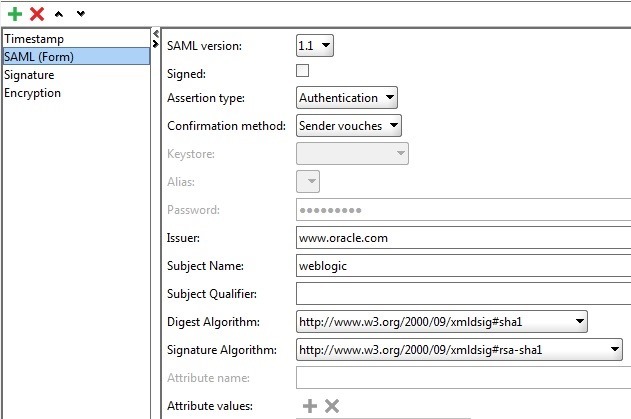 Requires both SAML Token and message body to be digitally signed, hence we need to modify above SAML token setup to consider signing and need to add separate Signature setup in Outgoing Configuration. 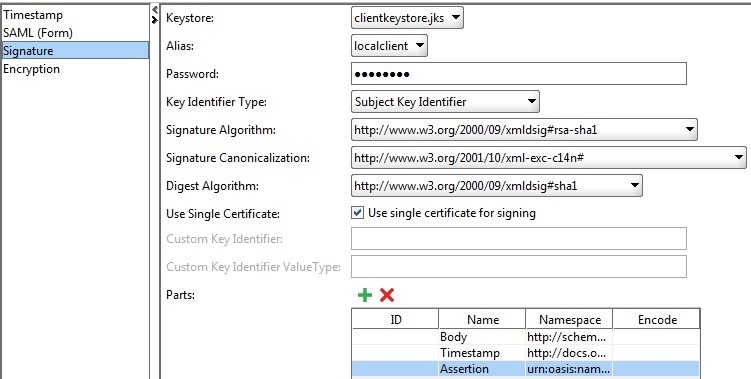 Check Signed attribute and use the client side keystore and private key alias as shown below. 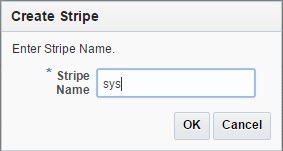 Add Signature setup in Outgoing Configuration as shown below. 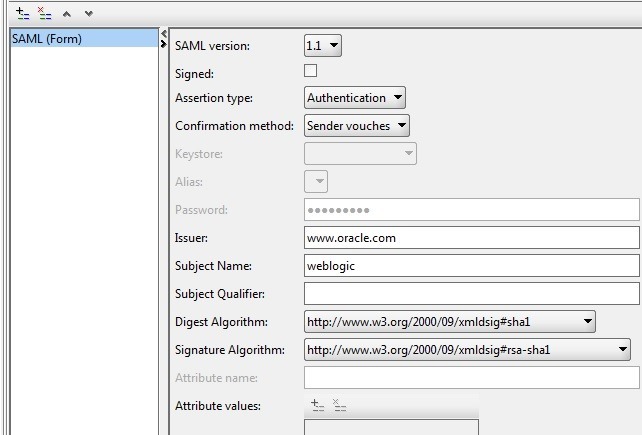 Requires to setup SAML Token, Timestamp, Signature and Encryption in Outgoing Configuration where as SAML Token, Timestamp and Body to be digitally signed and Body to be encrypted. Note: we should maintain the order Signature and Encryption in Outgoing Configuration as shown above. 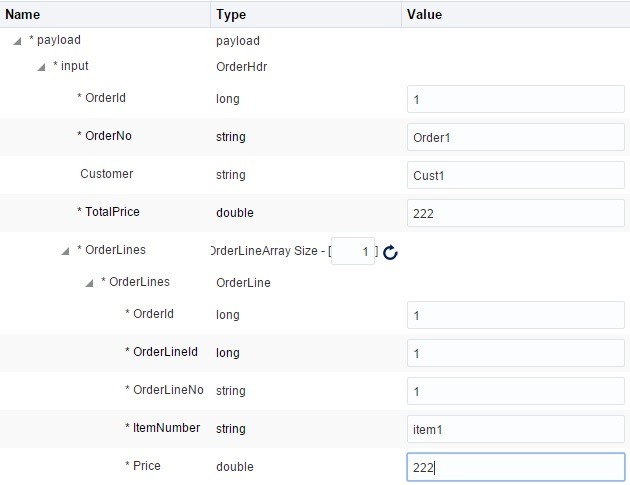 Attach both Outgoing and Incoming configuration as shown below. 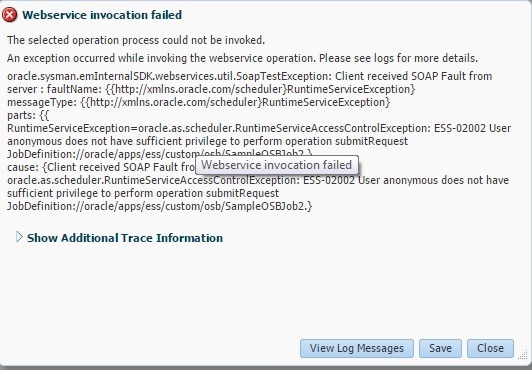 With above setup, the request is returning error response when I used SOAP UI5.0.0 but working with SOAP UI 5.2.0. 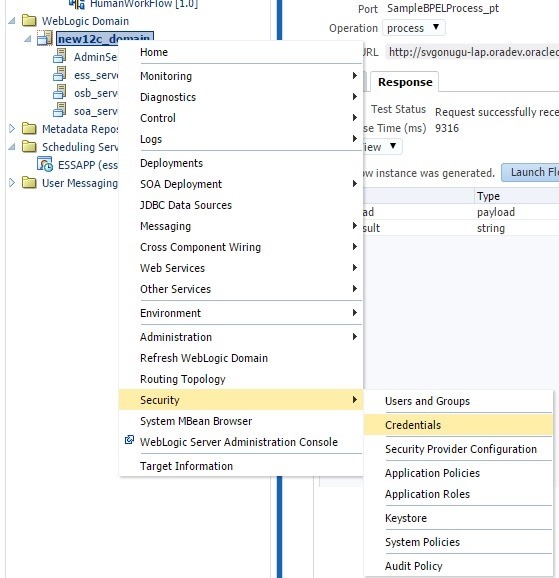 So I would recommend to use SOAP UI 5.2.0. Observe that, we had added Assertion as one of the Parts in Signature setup. 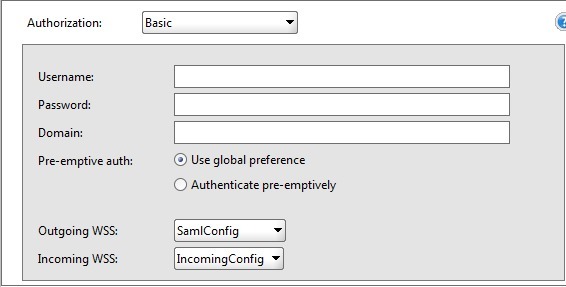 This is the only option working for Message Protection policy and it’s not working when signing setup is done in SAML Token by checking Signed. In SOAP UI, i got the saying Error getting response for […]; null even with all this setup. Following solution is given here to resolve this issue. 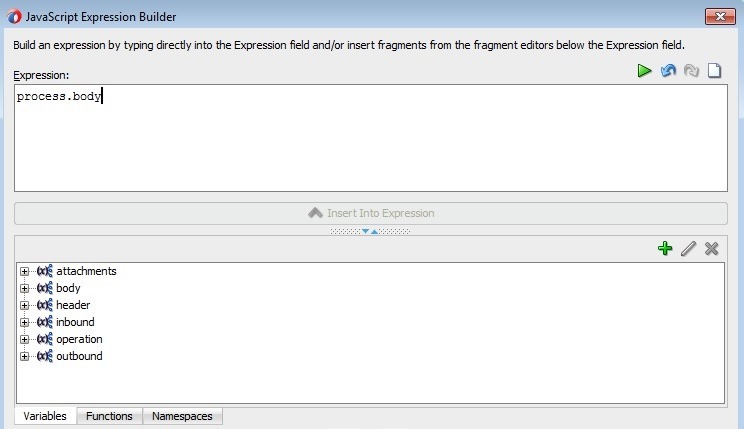 Replace the existing xmlsec-1.4.5.jar file in /lib folder with xmlsec-1.5.2.jar. 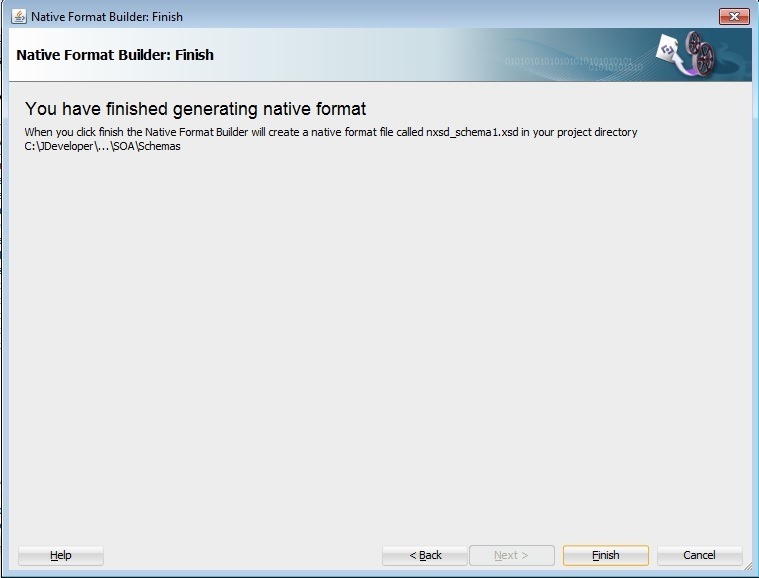 Replace the existing wss4j-1.6.16.jar file in /lib folder with wss4j-1.6.2.jar. 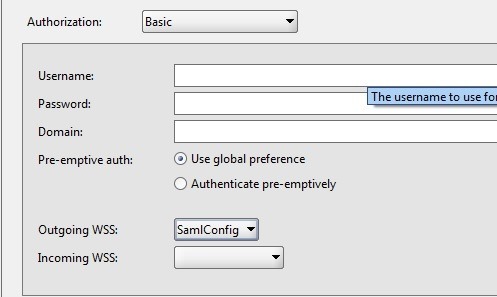 Required setup is similar to wss10_saml_token_service_ policy except that we have to use SAML Token version 2.0 as shown below. 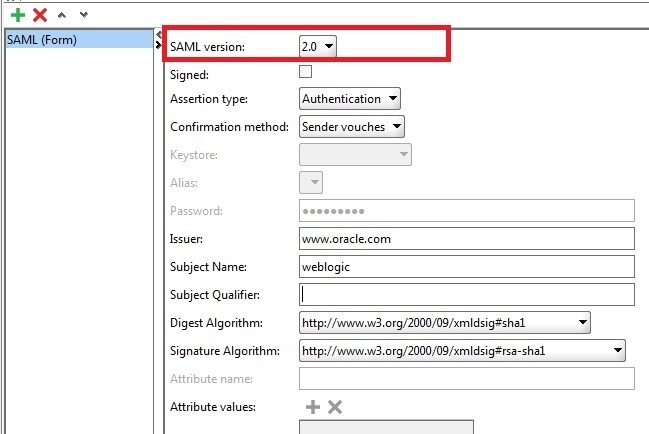 Required setup is similar to wss10_saml_token_with_message_protection_ service_ policy except that we have to use SAML Token V2.0 and have to add the following in Parts of Signature setup. Note the namespace change. 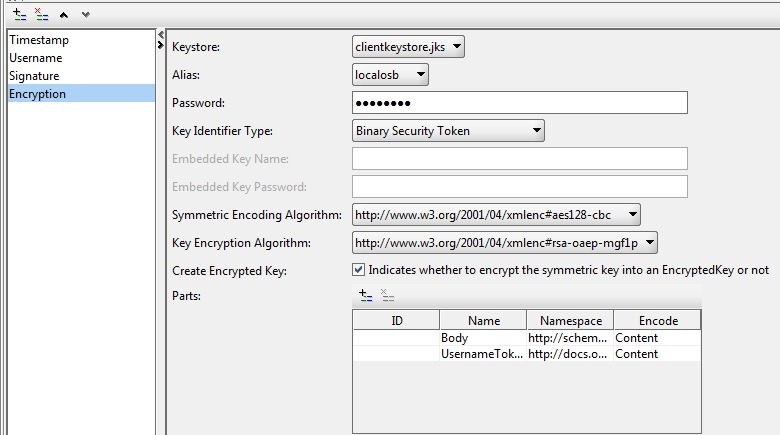 Similar setup as OWSM policy wss10_saml_token_with_message_protection _ service_ policy except that different Key Encryption, Encoding algorithms and Key referencing mechanism. Note: When we use 256-bit encryption algorithm in SOAP UI, we are seeing the error ‘java.security.InvalidKeyException: Illegal key size or default parameters’. This is because java does not support key sizes greater than 128 by default. To get rid of this error, we need to copy policy files local_policy.jar and US_export_policy.jar to %java_home%/jre/lib/security. 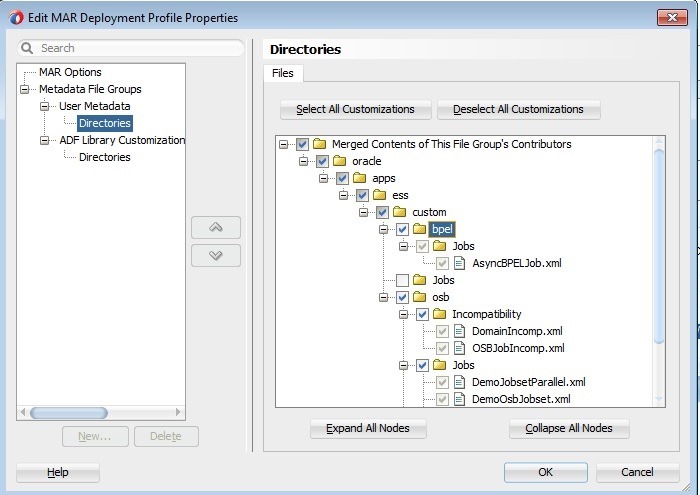 The policy files can be downloaded using the following links depending on the JDK you use. 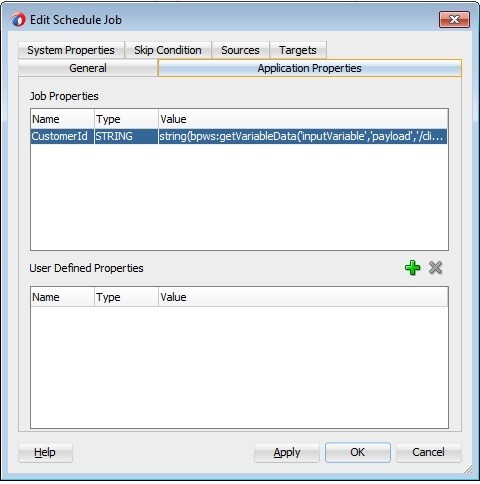 SOAP UI can either use your existing JDK installation or bundled JRE and this information can be found in <<SOAP UI Install Dir>>\bin\soapui.bat. If bundled JRE is used by SOAP UI then we need to copy above policy files to location <<SOAP UI Install Dir>>\jre\lib\security. You can get the SOAP UI project and keystores used in this post over here. 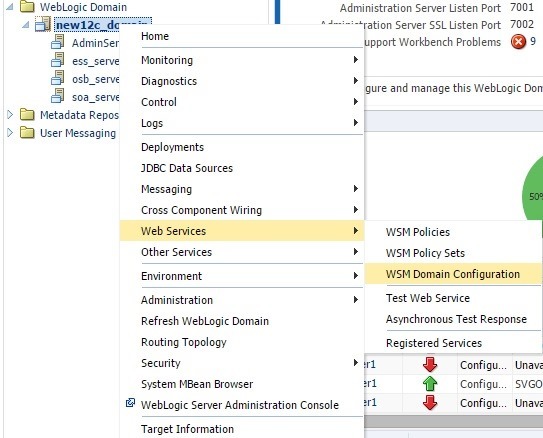 In this post, I will demonstrate required steps at both server and client side for the OWSM policy oracle/wss10_username_with_message_protection_ server_policy. I will use SOAP UI to demonstrate the client side setup. 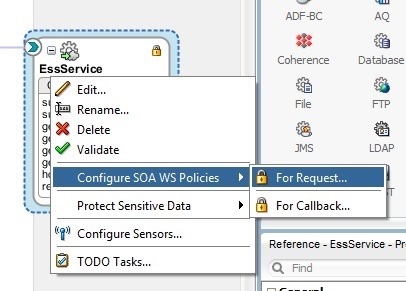 Attach OWSM policy to service, here I will be using OSB Proxy Service for demo. This OWSM policy requires private keys to be generated at both server and client side. So create clientkeystore.jks for SOAP UI and osbkeystore.jks for server using commands below. 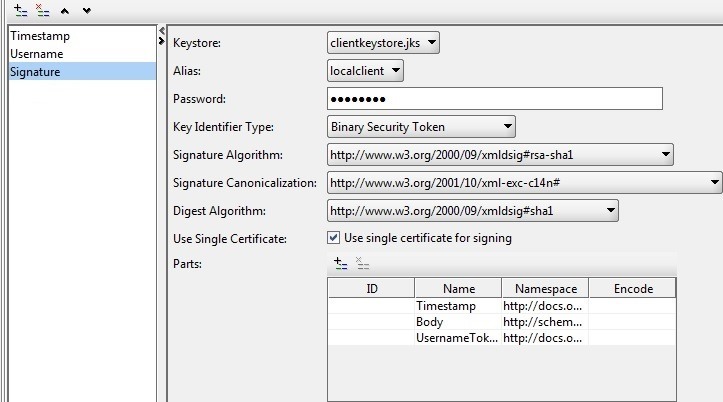 Export the public certificate from each keystore using following commands. Import the certificate into each other using following commands. 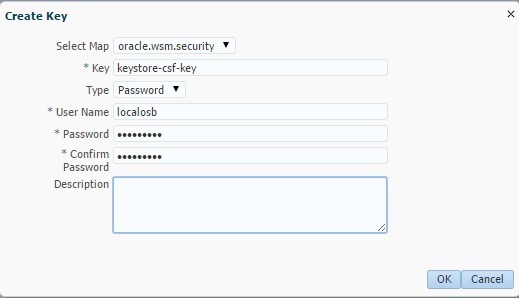 Now add these keys in oracle.wsm.security map using the following steps. 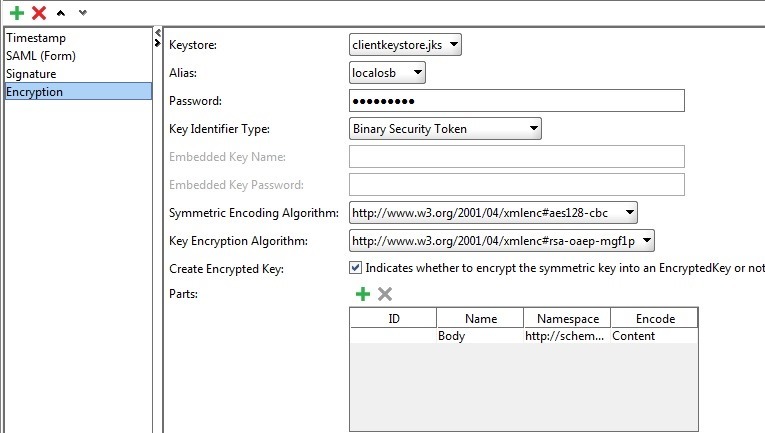 Create key keystore-csf-key as below. Also create other 2 keys enc-csf-key and sign-csf-key similar to above using the same alias localosb. 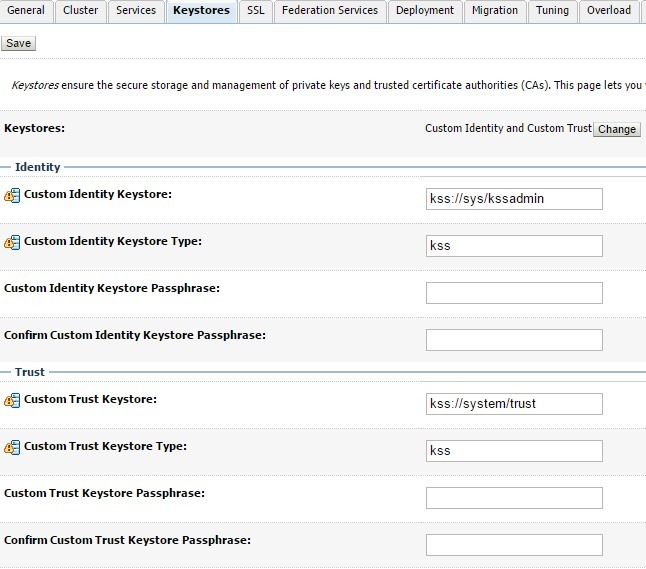 Now navigate to the WSM Domain Configuration as shown below to set the keystore and keys to be used by OWSM runtime. 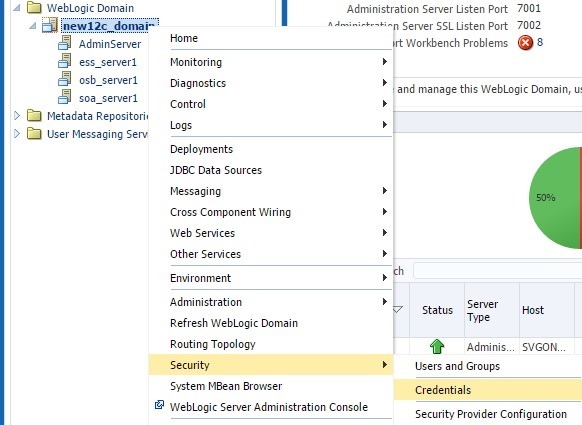 The SOAP UI documentation has detailed information related to ws-security setup here so I will keep my description brief and readers are recommended to go through the given link. 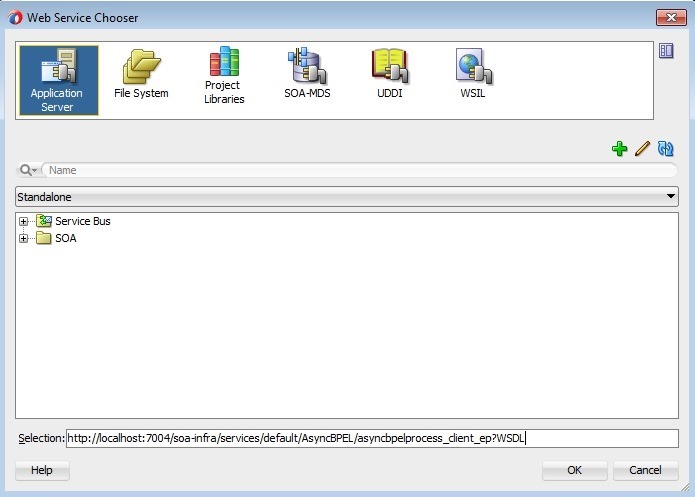 Double click on SOAP UI project where we can specify ws-security setup. 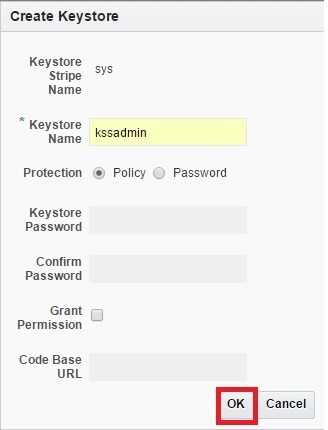 Add clientkeystore.jks in Keystores tab and give the key store password as shown below. Status should be shown as OK implies that it’s a valid keystore. 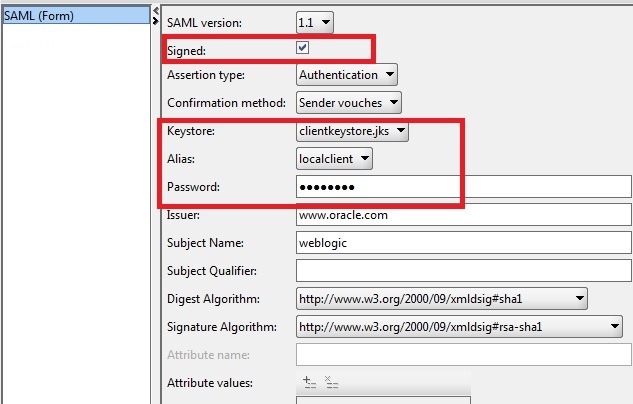 Since clientkeystore.jks has required keys for both encryption and digital signature, we have to just select this keystore in Incoming Configuration as shown below. 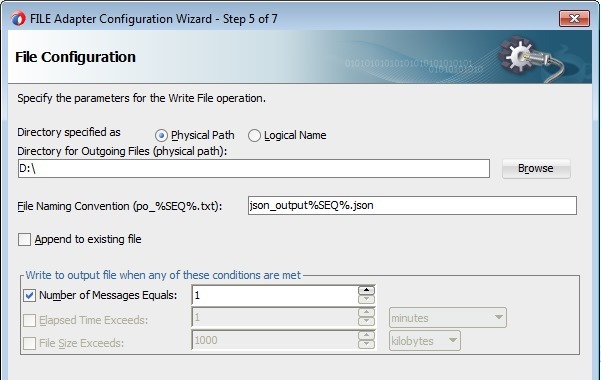 Add Outgoing Configuration with name OutConfig as shown below. Now we have to add the configuration for Timestamp, Username Token, Signature and Encryption in detail tabs of Outgoing Configuration as required. With all this setup in place, when I execute the request I was getting the error saying Error getting response for […]; null. Following is the solution given in one of the forum posts here. Note that, I was using SOAP UI 5.0.0. Note: We also have another way of attaching Outgoing Configuration to the request as shown below by doing right click on request window. 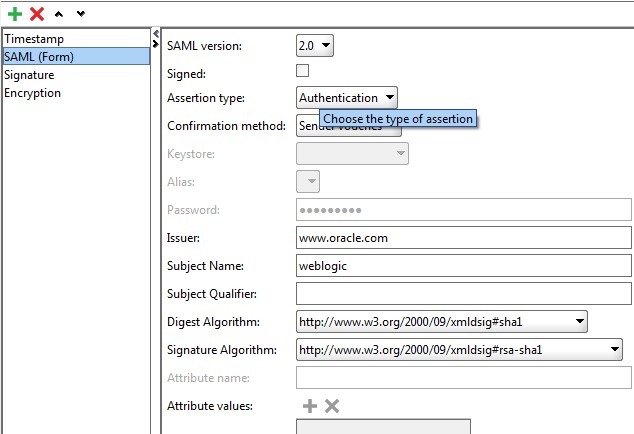 When we do this way, don’t select Format XML option on right click which is causing digital signature verification failure.So I always recommend the above mentioned way to attach Outgoing Configuration. 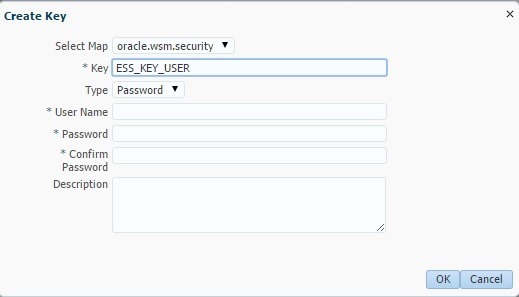 Similarly, for OWSM policy oracle/wss_username_token_service_policy the above Username token setup is enough. 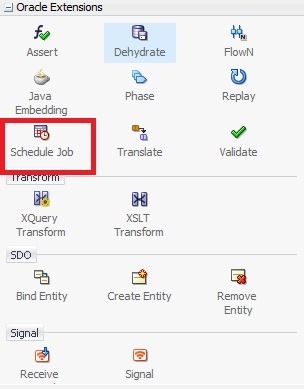 In this post, we will learn how to use the Schedule Job activity to submit a ESS request from BPEL process during orchestration. And we will use the ESS job created from this post. 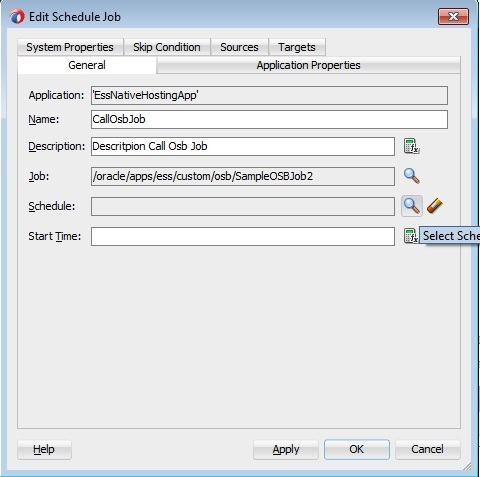 Create a Sync BPEL process and drag Schedule Job activity into BPEL from Components –> Oracle Extensions as shown below. 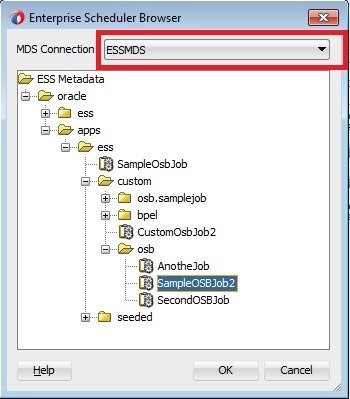 We need to create a MDS connection so that we can do the lookup for the ESS jobs. 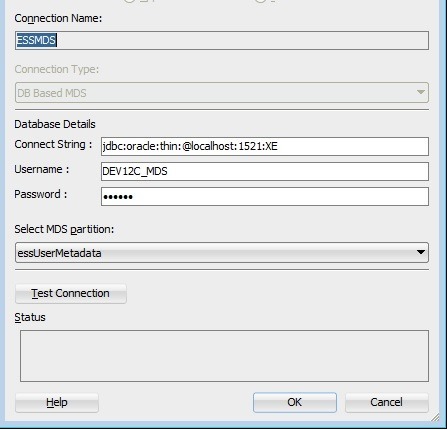 Create a new SOA-MDS Connection in Resources –> IDE Connections and select MDS partition essUserMetadata as shown below. 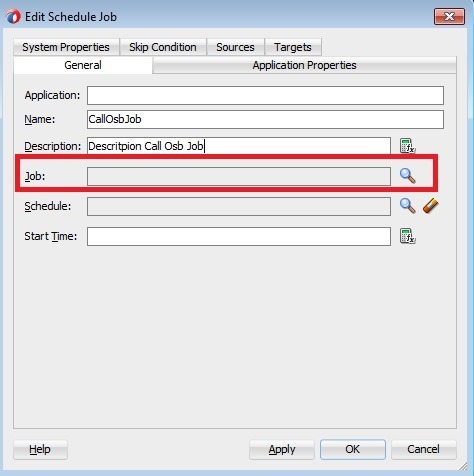 Double click on Schedule Job activity in BPEL to being up the below editor and select the required ESS job as shown in following screenshots. 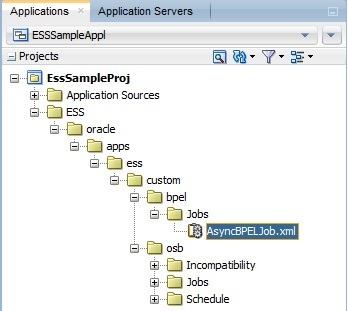 This way, we can also explore ESS jobs deployed to partition using different namespaces. Similarly, we can select Schedule if required as shown below. 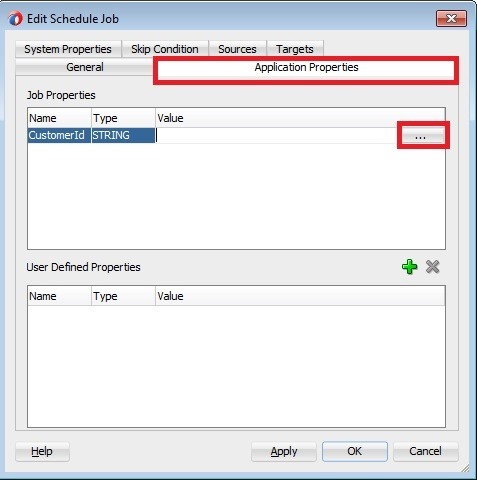 Navigate to Application Properties tab and give the value for Job Propetires using XPath expression as shown below. 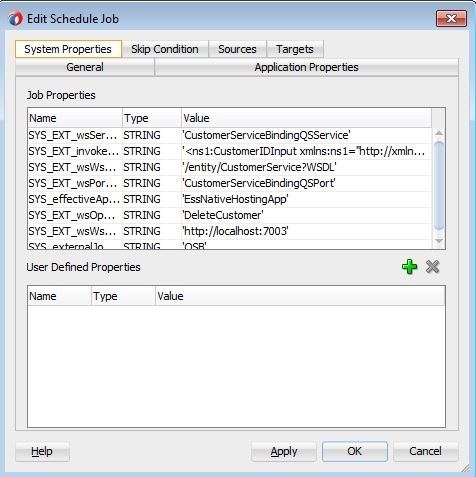 We can also verify the ESS Job system properties in System Properties tab. 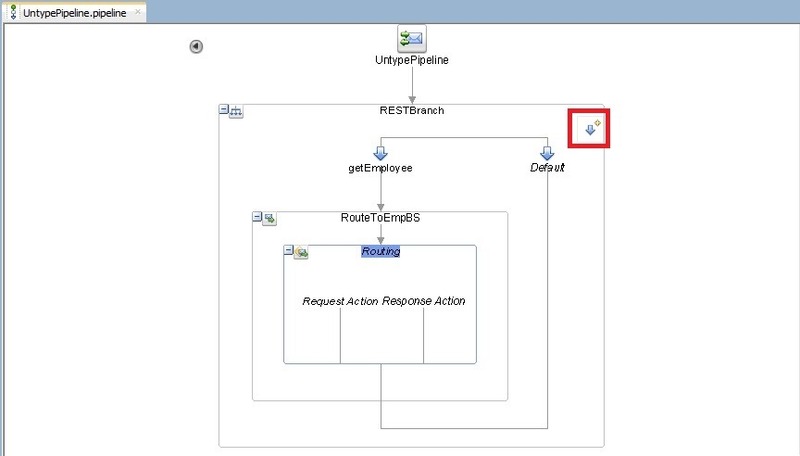 Click OK to observe a sequence of activities are created in your BPEL flow as shown below. We can click each of these activities and observe what has been done automatically for us. On selecting the job, we will see following artifacts get created automatically in our project. 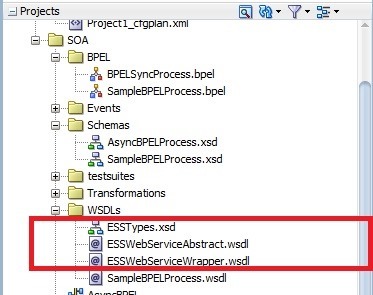 Since our composite using ESS abstract WSDL it will result into build errors. 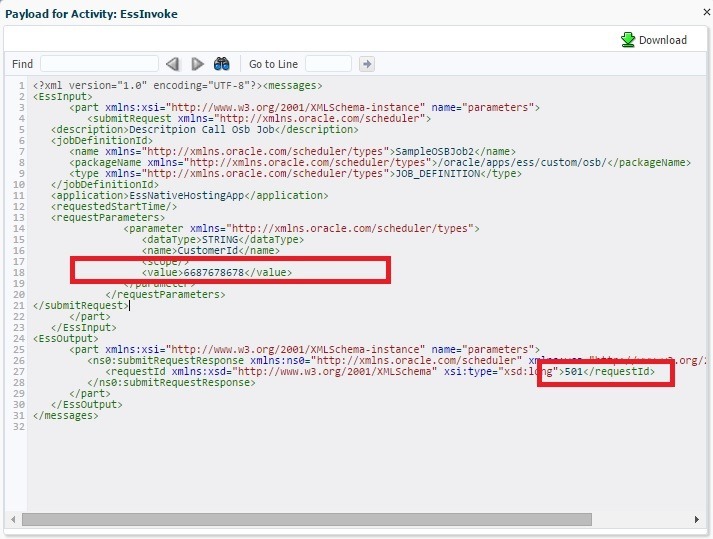 So modify your ESS partner link entry in composite.xml to add bindings and port as highlighted below. 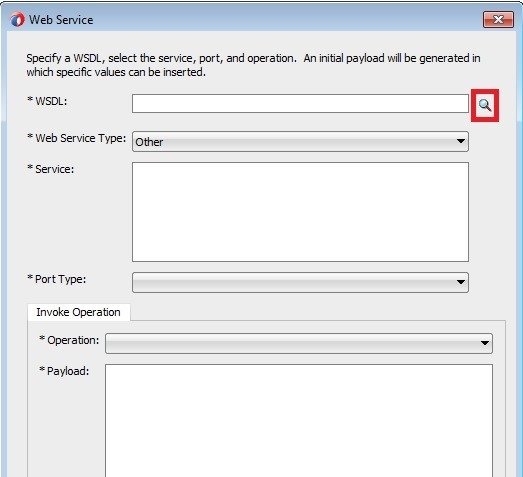 Or generate configuration plan for composite and give port and binding along with ESS Webservice location as shown below. 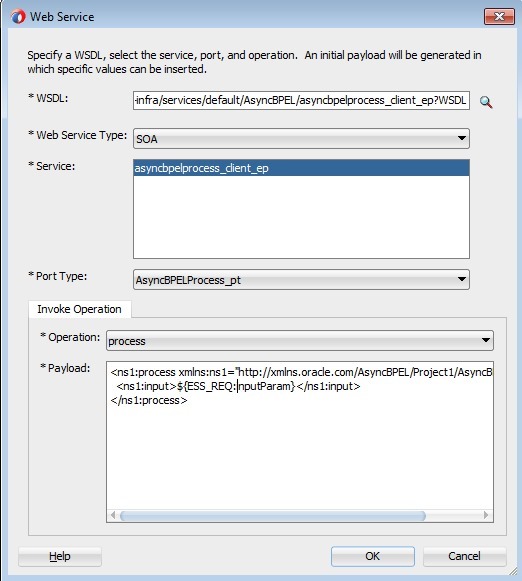 We can always verify ESS Webservice WSDLs by navigating to Webservices section in url >:>/ess">http://<<host>>:<<port>>/ess. 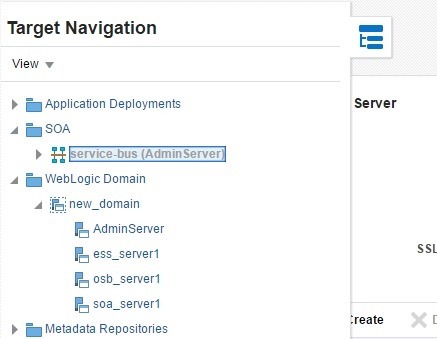 Deploy your SOA project using above configuration plan and Test. Now we will observe the following error as ESS Webservices can’t be run with anonymous user credentials. 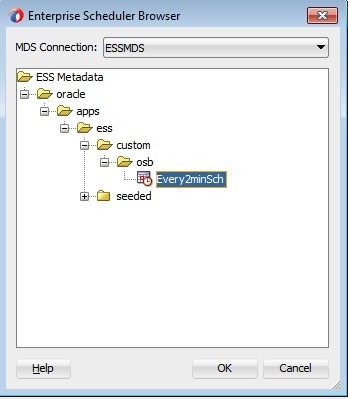 To get away with that, modify the ESS webservice by attaching OWSM policy as detailed by Lucas in his blog. 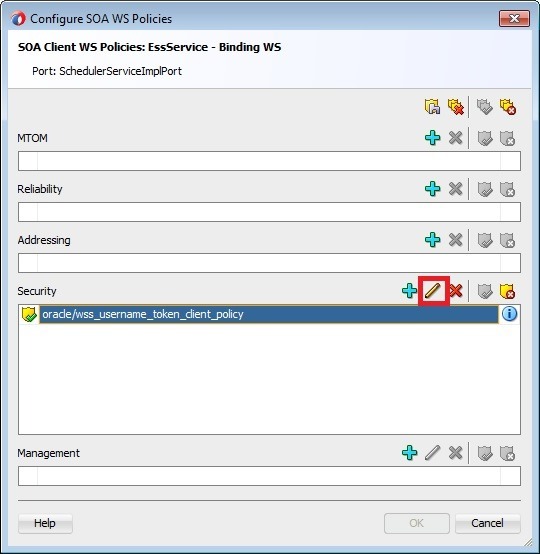 Since ESS Webservice is secured we need to attach the corresponding client policy to our Partner link and need to pass on the credentials of valid user. 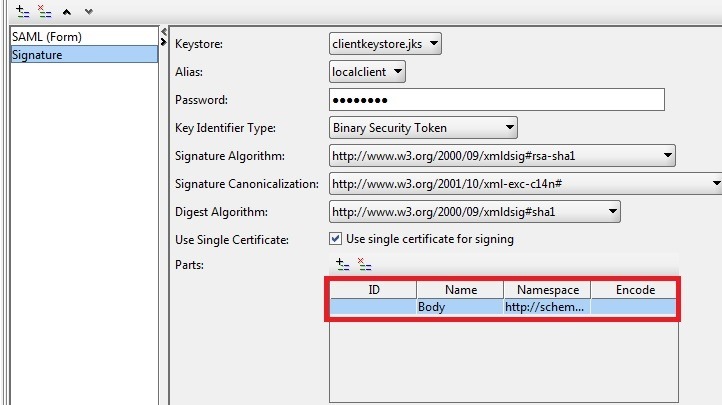 So as a first step, create a credential store key ESS_KEY_USER with weblogic credentials using the following steps in EM Console. Now attach the corresponding client policy to our partner link as shown below. Click pencil icon and modify OWSM policy to specify csf-key as shown below. 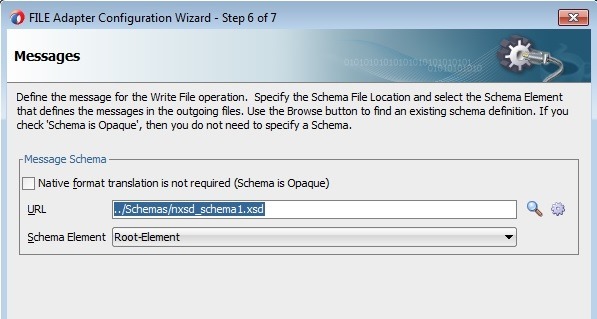 This would populate wsm-assembly.xml file with the policy details as below. Now again deploy the SOA composite and run. This time composite run will be successful and can observe the Request ID of ESS job as the response. 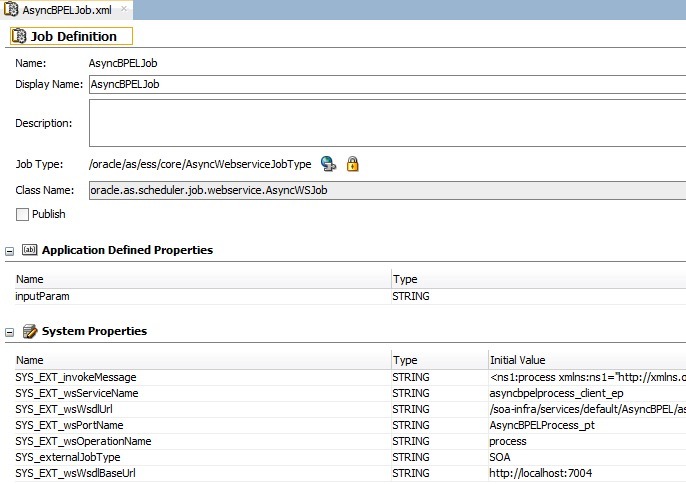 Navigate to ESSAPP –> Search Job Requests to see our job is submitted as expected and shows user as weblogic which is used in csf-key. You can find sample project here. 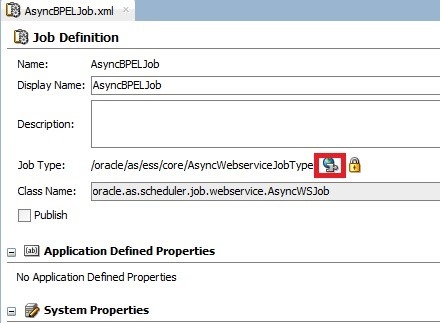 There is some run time error coming during BPEL process testing when we specified job description for Schedule Job activity as above. This is due to the missing quotes around so we have to manually open assign activity and surround your job description in quotes as shown below. 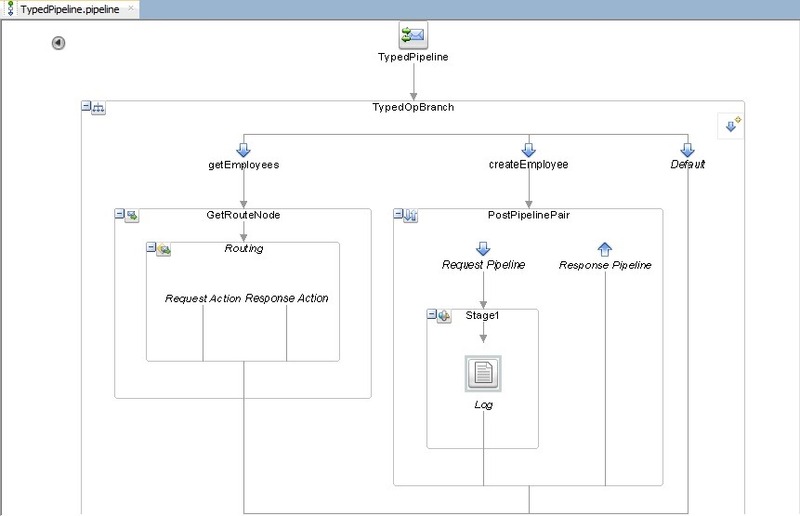 In the post, we have seen creating ESS Job Definition using synchronous web service. 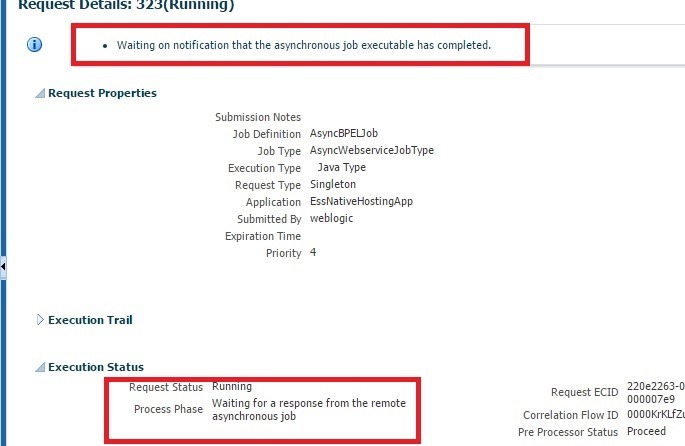 Now, we will look at creating Job Definition using Asynchronous BPEL web service having 5 min Wait activity to simulate the delayed response. 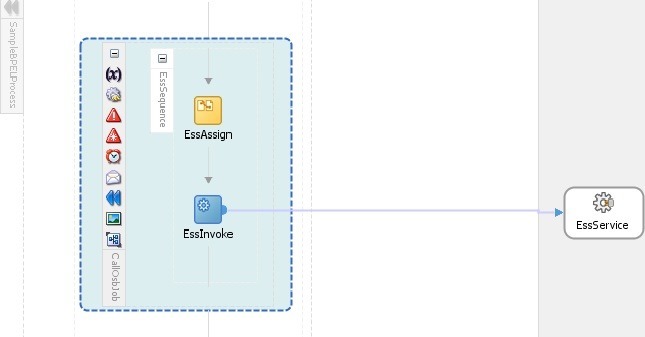 We will also take a look at other changes required for deployment when new job definition is created in existing ESS application in new package structure. 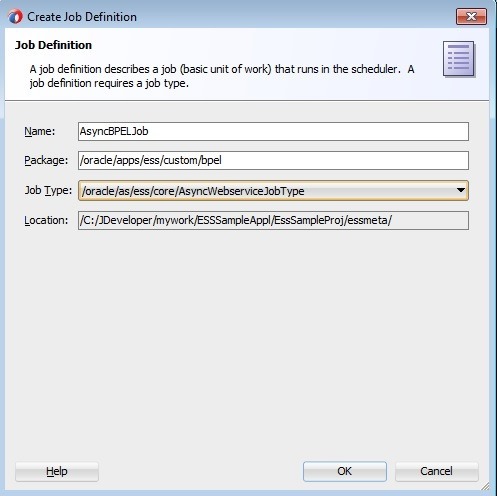 Create Async Job Definition with help of following screenshots. 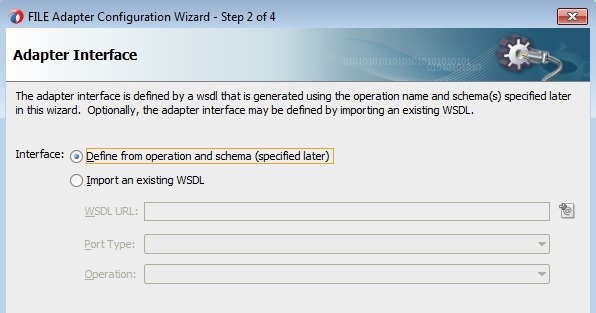 Make sure that you always use the concrete WSDL. You need to modify MAR profile to include the new job definition and also adf-config.xml file to include the valid namespace as shown below. 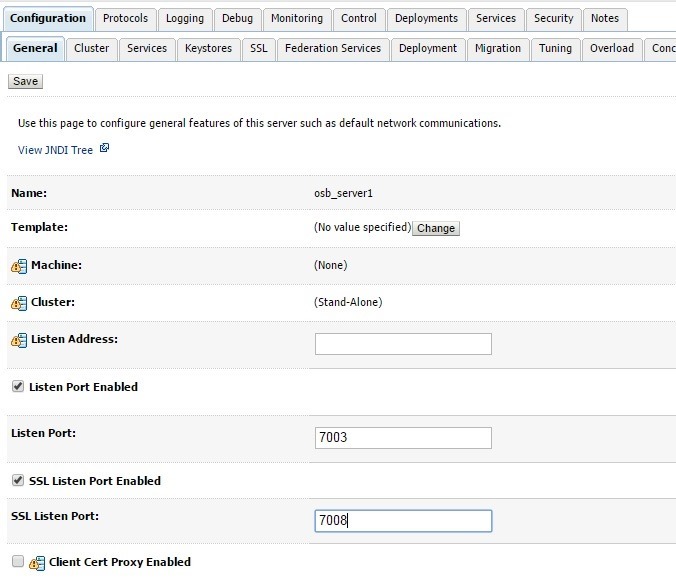 Now deploy ESS application and submit a new request using this job definition. 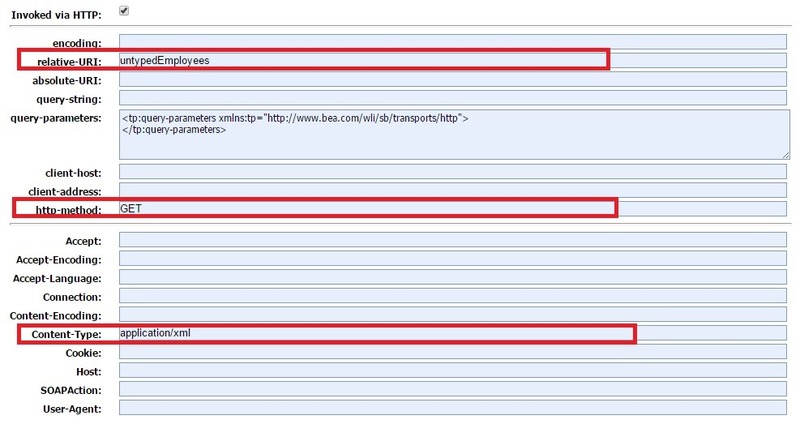 You would observe that ESS job status is in Running state but waiting for the response from BPEL web service as shown below. 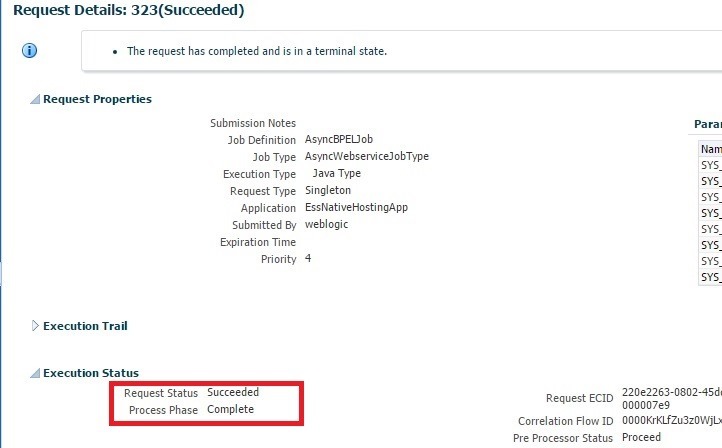 Once ESS job receives the response from asynchronous BPEL web service the job will be finished and shows status as Succeeded as shown below. You will see the similar behavior as above even when you use ADF BC service.